When Head Girl Ashley Remer told us that she would be doing a podcast for #HerStory, we were all excited. Rebecca Price created Chick History¬†and the #HerStory podcast to celebrate all the women in history who have been overlooked in favor of their male counterparts. This is a cause that’s important to all of us here at Girl Museum, and as such, we wanted to highlight Rebecca, who is one of our favorite contemporary women. 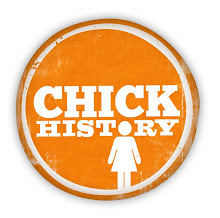 Rebecca was kind enough to answer some questions about Chick History and #HerStory, as well as her thoughts on the future (so to speak) of history. Katie: I know you go into this a bit in the “about” section of Chick History, but was there a specific event, woman, or instance that motivated you to start Chick History? Tied into that, was there something specific that sparked the idea for the #HerStory podcast? Rebecca: I’ve always been passionate about women’s history and material culture, and I’m a museum professional interested in outreach, education, and collaboration. Chick History was a way for me to combine those interests in my own way, and start to explore all the various platforms the Internet provides to network and reach an audience. I think the Internet, how people use it, and social media have created a new world for educational and cultural outreach, and I’m obsessed with exploring and finding new, creative, and forward-thinking ways to use all those tools and resources. The #HerStory Project is the biggest project I’ve undertaken so far. A seed of thought was planted in my head from a fellow museum professional (Eloise Batic, who did Mary Pickford in #HerStory #16). She and I were talking about women’s history and I was telling her about Chick History and she told me she would love to do something for it. That was that, but the idea stuck in my head for several months. What could she do? What would it look like? Then, one morning, I thought of the idea for #HerStory. What if Eloise could choose someone in history she adored and talk about her on her own terms? Just like I say on the blog, everyone out there has someone they admire and just can‚Äôt stop talking about. And #HerStory became that chance for women to share that story. The title obviously references the herstory/history play on words, but it’s also possessive. This is Eloise’s story, her story of Mary Pickford. Funny, I don‚Äôt think I ever told Eloise that. Even funnier, when we first recorded her episode on Mary Pickford, it was almost an hour because we couldn’t stop talking. We had to do a second take for the short format of #HerStory. I still have the long version and plan to put it up at some point. Katie: If you were to interview yourself, who would your woman in history be? Rebecca: Actually, I do plan to finish the project with my selection in the final episode. I can’t say who it is, but I’ll give a hint. It is one of Henry VIII’s wives‚Ä¶but not the one you would think! Katie: Has the #HerStory podcast included any women you had not heard of prior to the interviews? Rebecca: Absolutely. That is what is great about this project. It demonstrates that women’s history has such a depth that you are constantly learning new and fascinating biographies and stories, as well as updating your knowledge on the ones you already know. We don’t have to be satisfied with the same canonical women’s biographies we were taught in school. Women’s history is a very rich and diverse field, and there is more out there to be discovered. Just some of the brand new women for me, that have already been published, were Kate Warne (#14), Martha Putney (#15), and Hannah Solomon (#24). And of course, there are ones that I know the name but I really learn about her with the project, like Evelyn Nesbit (#5). Katie: As a woman and a historian, do you think history will continue to be fragmented or will there be an eventual cohesion? Meaning, will we continue to see “black history,” “women’s history,” and all the various “groupings” that can be made, or will history eventually encompass all these things equally? Rebecca: What I see in the field are a couple of trends. First, the fringe histories as they’ve been known for the past several decades have become mainstream. Black history, women’s history, LGBT history, Asian history, etc., these are now all seen as scholarly disciplines. It sounds patronizing when you put it like that, but the discipline of women’s studies has only been around for the last half century or so, and by the 1990s it proved it was a contender in the field of history. Second, funding for research, conservation, museums, publications – the humanities in general really – has moved towards the fields of social history and conserving the parts of history that have been overlooked until recently. It’s very difficult to get a grant to do work on something unless it is somehow related to a previously under-served group. All that is to say that we are moving in a positive direction for the “idea” of history to be more inclusive. Think about what you most likely learned in high school – the presidents and wars. If you watch the History Channel as your source, then it’s mostly the same. Military history and political history have had a monopoly on the idea of history for a very long time, when in fact they are really just disciplines of history as much as women’s history or African-American history. I can say that there is a strong effort in K-12 education here in America to try and incorporate more of the other histories into the textbooks, and more than as just sidebars. It’s hit or miss with some of them, but Rome wasn’t built in a day! Katie: What kind of feedback have you been getting about the blog and podcasts? If you have been getting non-positive responses, how do you react to those, both internally (personally) and externally (how you respond – or not – on the blog)? Rebecca: Everyone who has participated has been extremely supportive, and there have been many of the speakers who have gone above and beyond with their help in promotion and getting additional guests to come on board. For me, one of the best comments I received on a post was from another women’s history blogger who said I was going to make her go broke with all the book recommendations! Reading is such important part of the project and I was happy to hear that. In the first podcast, where I introduce the project and in the About section on the blog, I let everyone know this is a different way of learning history. It’s not about names or dates, it’s about memory and passion, and ultimately about personal connections with the past. That was my number one concern when starting this project, was that feedback would criticize if a guest “left something out.” But reaction has proven the opposite. I see things like “Oh, I love Annie Oakley, too!” or “I didn’t know that about Eleanor Roosevelt.” In the end, it’s up to the guest and what is important to them about their particular woman. The way I would tell someone’s story is completely different than the way you would tell a story. So it’s empowering and shows that there are other ways to look at history. Katie: Is there anything else you want to share about yourself, Chick History, #Her Story, or history/museums in general? This story really gets to the heart of history. I think it is important for people to realize that history is a constantly evolving discipline. Not only are new discoveries made everyday that make historians and professionals reevaluate previous thought, but the theories of history have modernized as well, causing new avenues of interpretation. Twenty years ago, if you mentioned the name Sally Hemmings on the grounds of Monticello it was blasphemy. Now, Annette Gordon-Reeds’ impeccable work on Sally Hemmings’ and Thomas Jefferson’s relationship has become a staple of the museum’s new education center and visitor experience.The same goes for museums like Girl Museum. We are expanding our definition of what it means to be a museum and education center, and more importantly, how to reach an audience without the more traditional avenues like a physical space and a collection. I’m a museum person, so I will always believe having objects is a precious thing, but now we are entering the 21st Century where there is room for all kinds of museums. In a way, Chick History is a small part in that dialogue and effort as well. Thank you, Rebecca, for answering my questions. Chick History is a wonderful, if sadly necessary, reminder that women have always done big things, whether history has decided to remember them or not. Head Girl Ashley Remer’s #HerStory podcast on sculpture Augusta Savage can be found here, all the stories can be found here, and please be sure to visit Chick History. Thank you so much for the interview and sharing it! “Whether history has decided to remember them or not.” Love that! I am going to quote you on that when I get a chance. Great interview. Very compelling. Thanks!